Is there any problem with Nansian and the BN chosen candidate Anthony Nogeh or the BN Machinery? THis we can’t answer and its up to BN hierarchy and LEADERSHIP to put a stop to this pettiness to ensure BN retains this Parliamentary seat. INFIGHTING AND UNWILLINGNESS OF BN ADUN TO ASSIST AND WALKABOUT AND CAMPAIGN FOR BN WILL ENSURE PAKATAN BENEFITS AND CAPITALISES. BN WAITING FOR NANSIAN TO GO ON CAMPAIGN TRAIL WITH NOGEH? It’s cleverly worded said a political source but it will still anger many SPDP members who are already campaigning on the ground and our earlier posting. 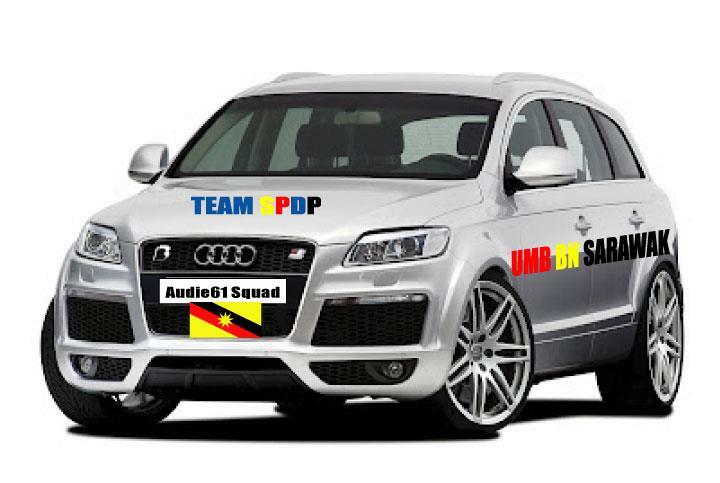 : “I am a Barisan man and a team player“ should have sent a clear message. CM’s message which was published in todays English daily headlines,”CM: Nansian’s cabinet post temporary and can be read here http://www.theborneopost.com/2013/04/24/cm-nansians-cabinet-post-temporary/ indicates that the equation has changed since 2011. Anthony Nogeh seems upbeat when he was met by some senior BN leaders at PBB Hqs.and said,”CM’s statement have assisted to dispel all doubts on Nansian and its a clear message to him to cut the rope or he himself will be in further trouble. Our source in Bau says ,”It will be the “KISS OF DEATH” if CM’s words are not heeded. The political implications will be greater than he can imagine. Nogeh and his team for now will concentrate on retaining the seat for BN. TOO GOOD TO BE TRUE, ISN’T IT..?? We received an sms from MP192 BN candidate Anthony Nogeh spokesman” YB peter Nansian ada berucap di gereja Kpg Apar pagi tadi nyuruh org kpg ngundi calon yg udah molah kerja dgn rakyat bukan calon yg kita sik kenal,la statement Nansian, maksud nya undi TIKI. If BN loses this seat Tiki and the Geng must be blamed. He is spliting BN votes and the actions are not helping BN retain the seat. Incumbent MP for Mas Gading Tiki Lafe may pay the price for contesting as an Independent against Anthony Nogeh from Sarawak Progressive Democratic Party (SPDP) in the coming general election. His chairmanship of the National Service Training Board (NSTB) is at stake as SPDP supporters and even the opposition candidate from State Reform Party (Star) Patrick Anek Uren demand he be sacked. Tiki (right) who has represented Mas Gading for three terms was sacked from SPDP, which is part of the BN coalition, in Nov 2011 following a leadership tussle. Since then he and four other elected representatives also sacked from SPDP, formed what is known as ‘Kelab BN Sarawak’. Paul Igai, SPDP deputy secretary general, said that Tiki should know what to do as he is no longer part of the party. “He should step down if he is a principled man. Other than that we have nothing more to say,” said Igai. Tasik Biru PBB chairperson John Nyigor also said that Tiki should step down or face being forced to resign. “The possibility is there as people are going after him,” he said. Uren is also asking why Tiki is still the chairperson of the National Service Training Board when he is an Independent candidate for Mas Gading where BN already has a candidate. 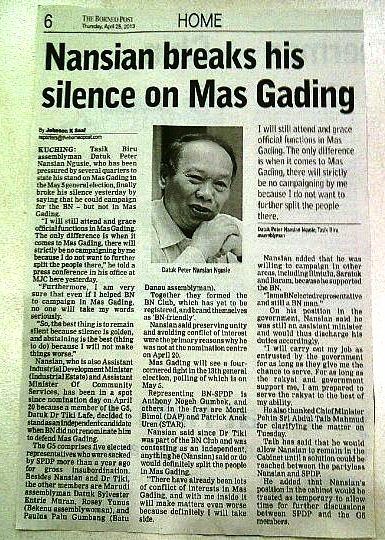 “The voters in Mas Gading deserve answers,” he added. However Tiki said that he had done nothing that required him to resign from the chairpersonship of the National Service Training Board. “However, I leave it to the prime minister,” he said.